Robo Advisors or Robo-advisers are financial advisors that offer investment advice online without human intervention. They give recommendations based on mathematical rules or algorithms. The count of Robo Advisors is increasing in India. 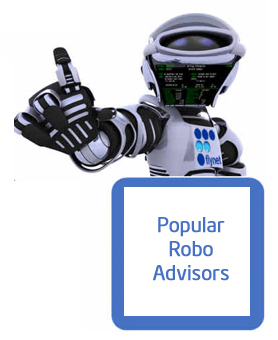 Many average investors prefer robo advisor over other advisor. The prime reason is robo advisor offers low-cost services. You just need to answer a few questions and advisor provide prompt investment advice. If you are planning to invest your money and looking for robo advisor, here is a list of Top 5 Popular Robo Advisors in India along with the following information. In short, if you continue reading this post, you will get a lot of knowledge about Investment Advisors in India. Robo Advisors as the name indicates, it is an advisor that offer services automatically based on a specific set of rules and algorithms. They are programmed to take specific inputs and generate output. On the platform of robo advisor, you need to answer specific questions such as current situations, goal, risk profile, date of birth, a time period of investment etc. Based on data provided as inputs these advisor suggests investment portfolio. The advice given by robo advisors are divided into multiple parts such as tax planning advice, insurance advice, health insurance planning, investment advice etc. The advice given by them differs from traditional financial advisors. As traditional advisor usually deep dive and provide complete financial planning advice. However, please note that cost associated with a traditional advisor is higher compared to robo advisor. There are multiple benefits of robo advisor. Few of them are given below. Compared to traditional advisor, robo advisor is low-cost affair. These type of advisors eliminates human error. These type of advisors are accessible 24×7 anytime, anywhere. You can interact and change your inputs multiple times to check function of advisor. These type of advisors are not biased by specific products. Few Drawbacks of robo advisor are given below. Advice is given based on inbuilt algorithm. In case of a mistake it may lead to wrong advice. These type of advisors are not programmed for an extraordinary situation or financial crisis. Also Read – DIY, Salesman or Financial Planner what is your choice? After getting a complete understanding about robo advisor, you must be wondering – all these robo advisors are same or different. The answer is – All these robo advisors are not the same. They have a different algorithm and complexity. The output generated by these advisors differs with input given such as financial situation, goal, risk profile etc. If you are planning to invest using robo advisor, you should evaluate these advisors carefully. Here is a list of few popular as well as emerging robo advisory players in India. Who should use robo advisor? Well, it is a debatable topic. Prima facie, anyone who is planning to invest money can use Robo advisor in India. However, robo advisors are suitable for novice (new) investor who has limited knowledge and experience about the financial market. Expert investors should either use DIY (Do it yourself) concept or rely on time-tested traditional advisor approach. Do you use Robo Advisor while making an investment? Do share your experience in the comment section given below. « How NRI can get benefits of DTAA agreement of Taxation? How Robo adviser will help me, a 70 yrs old retired person to manage around 8 laks investment in equity n mutual fund. It is not advisable to look at Robo Adviser looking at your age.You should go for fee based planner or Invest in low risk investment options such as Fixed deposit etc.